Attention Clark Sharks!! 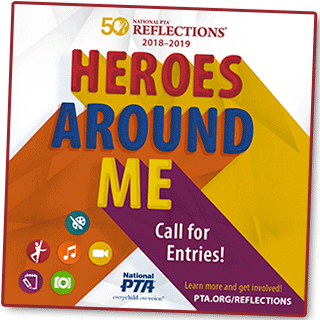 It’s time for Reflections, the Annual PTA art contest! Join us and have fun unleashing your inner artist as you apply your unique interpretation of this year’s theme to your art. Every fall, PTA invites students to participate in a national art program to explore their artistic interests. This year’s theme is “Heroes Around Me” and is a great opportunity to engage students in learning Clark’s objectives of being safe, kind, and productive by inspiring them to look up to the great heroes present in our community. Students are encouraged to create works of art supporting this theme in the areas of Literature, Photography, or Visual Arts. Students may submit as many projects, in as many categories, as they wish! All art submissions must be original works by the student with no adult instruction/alteration. Return the sign-up found on the Reflections flier sent home with your student this week! Click the following links to download the formal application form and to review guidelines for sizing and mounting, media, etc., for your specific category of interest. Deadline for submission of all artwork to the Clark PTA office is Monday, November 5th at 3 PM. A gallery walk/reception for all artwork submissions will be held at Clark on Gingerbread Night, 7th December. You may submit up to a total of three entries for the category 2D visual arts. More information is found on the Clark PTA website.